I just watched this year’s Oscar-winning documentary Music by Prudence, which profiles Prudence Mabhena, a 21-year-old Zimbabwean singer. Growing up with a disability called arthrogryposis, which significantly limits her physical mobility, Prudence has had to defy low expectations and vicious prejudices just to survive. Rejected by her parents and her culture, Prudence finally, literally found her voice when she began to sing. 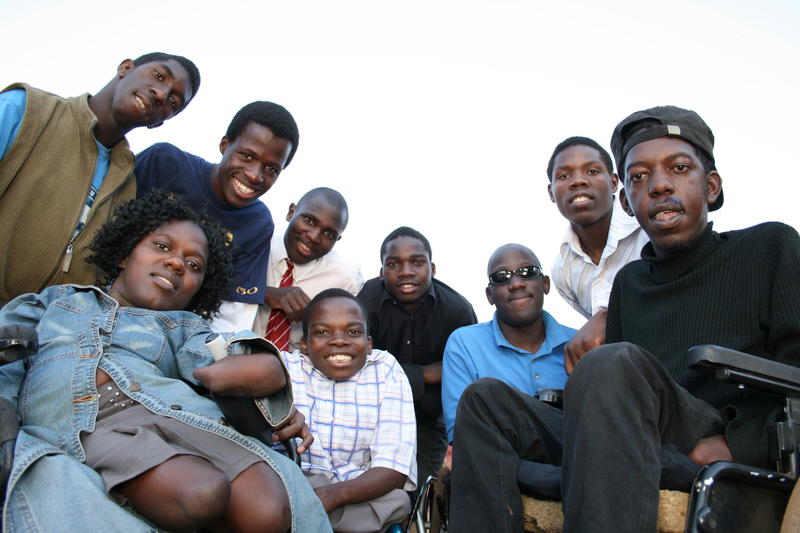 With several of her classmates at a school for children with disabilities in Bulawayo, Prudence has formed a band called Liyana. This is not an easy movie to find, unless you’re an HBO subscriber; it premiered there last week, and will be broadcast throughout this month. The DVD has not been released yet. The movie is playing at a few film festivals around the country, and you can purchase and download the soundtrack from iTunes, Amazon, etc. My advice: See it; hear it; pass the word. Get more information at the Music by Prudence official movie website. As for myself, I’m adding Music by Prudence to my list of all-time favorite disability-related documentaries. This thoughtful post, entitled “Childhood, Disability, and Public Space,” discusses the negative judgments made by some nondisabled adults about behaviors sometimes exhibited by children, and/or by adults with developmental disabilities. The writer is careful to emphasize that she does not mean to imply that adults with DD are childish or childlike. Rather, she is concerned about the different and related prejudices that both groups face when venturing into public places. This piece resonates with me on several levels. I have a daughter, just on the cusp between childhood and adulthood, who carries several labels including DD. She is gregarious and fun-loving, and loves to go to museums, plays, sporting events, and other activities that take place in shared public venues. Most of the time, when we’re out and about, she is courteous and perfectly appropriate… sometimes, not so much. At these times, she talks too loudly during a performance, or eats messily while her napkin remains pristine, or yells at her parents for trying to correct her. Her other mom and I work with her to learn good social skills, and she’s making real progress, but I’m aware that there are people out there who think kids like her should just stay home. I’ve read news stories about families getting kicked out of movie theaters because of sounds made by their autistic children. I’ve heard of restaurant patrons requesting a different table because they didn’t want to watch a disabled person eat. I’ve seen signs posted in stores, making supposedly funny threats against children who misbehave. I know that we all have certain expectations when we go shopping, or buy a ticket to a performance. In any society that aspires to freedom and equality, those expectations need to include the variations in atmosphere introduced by people of different ages, abilities, cultures, and so on. I myself am a very noticeable presence in any public venue. I use a power wheelchair which I operate by blowing into a tube. I have more tubes going into my nose, connected to a mechanical ventilator, which pumps air into my lungs as I breathe. At symphony orchestra concerts, during pianissimo passages, I’ve become acutely aware of the mechanical sounds emanating from my respiratory equipment. My self-consciousness has sometimes veered close to embarrassment, but I’ve reminded myself that I have as much right as anyone to be in the presence of that great music. I go so far as to believe that I make an important contribution to those public gatherings, even when I am merely a customer, a passerby, or an audience member. I help to demonstrate, without fanfare, that all kinds of people get around in the world in all kinds of ways. Everyone is not the same. Some people make unusual noises. Some look, move, or act a bit differently. Some people even breathe differently. That’s one of the things I want my daughter to learn when we go out — though it’s clear to me that she already knows that, more comfortably and more generously than most people. That’s why we need accessible buildings and buses. That’s why we need welcoming businesses and cultural facilities. That’s why we need to re-commit to the idea of real community. As the U.S. continues to escalate its war in/on Afghanistan, inevitably casualties — both deaths and permanent disabilities — will continue to increase. Some returning American soldiers with disabilities become media darlings, “wounded warriors” competing in Paralympic events, while the majority struggle to adapt to their changed conditions, and to find jobs and needed support services. It’s even more complicated for the “other” side’s casualties. Today I ran across this article on the website Voices for Creative Nonviolence. It’s a well-written, mostly pity-free profile of a young Afghan man who became disabled as a result of U.S. air attacks. He is in Pakistan now, working hard to rehabilitate with the goal of reintegrating back into his own community someday, but the war is a major barrier to this goal. This article offers insight into day-to-day issues facing ordinary disabled people in different parts of the world. And it manages to avoid the melodrama that peace advocates sometimes invoke when talking about disabilities caused by war. Even as we fight our own critical battles for civil rights and essential support services, disability rights activists must be aware of the impact of our government’s military actions on people with disabilities across the globe.